Home GiveAways Information Movie OnlineContest Services Trending WeChat Stick-It-To-Win-It PROMO: Your Movie Date is Free! To celebrate an early Christmas indulgence, WeChat, as the leading social network messaging app in the Philippines, is giving away an early Ber-months treat to its mobile users from September 22 to October 6, 2014. Dubbed as “Stick-It-To-Win-It PROMO!,” you can Insta-Win toget a FREE Movie Tickets. Simply share your favorite WeChat stickers with friends. 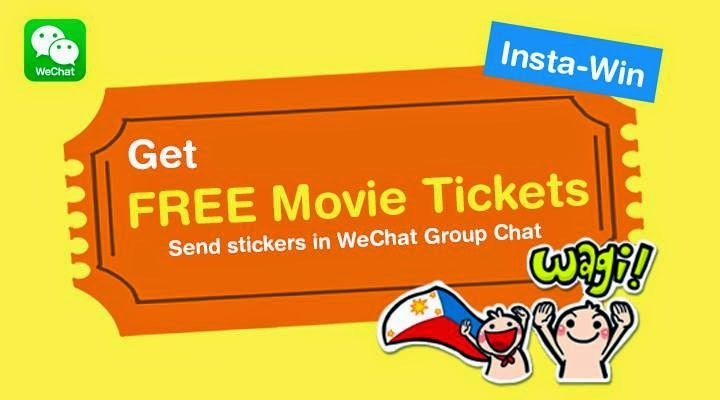 WeChat will be giving away 1,500 SM Cinema e-coupon movie tickets worth P200 each. So download the app today and send stickers every day to increase your chances to win! For extra bonus prizes, like the WeChat Facebook page or share and tag WeChat Philippines. WeChat is available free for download on Android, BlackBerry, iOS, Symbian and Windows operating system. So, what are you waiting for? Download now! For more information, visit: wechawechat.comt.com. or Like us on Facebook: WeChat Philippines.